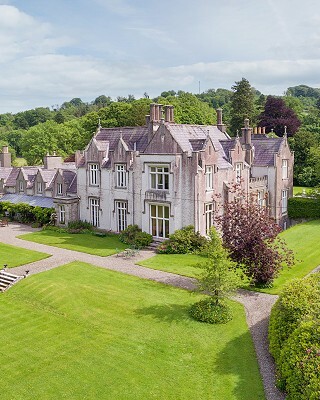 Drive southwards from Dublin through the gloriously rugged Wicklow Mountains and, at the foot of the famous Sally Gap, you’ll find The Manor, a rambling family home of great charm and character. The house was rebuilt in 1835 in the gabled Elizabethan-Gothic style and its large, comfortable, sunny rooms afford wonderful views of the surrounding countryside with the mountains as a backdrop. The owner, Margaret Cully, is an accomplished hostess, a fine cook and a dedicated gardener. The Manor is a superb base for the three-Day Event at Punchestown, or for visiting Russborough, one of Ireland’s most beautiful houses with an internationally important art collection. The house has a series of elegant reception rooms and guests can enjoy fine country cooking by candlelight in the panelled dining room. There are 40 acres of mature gardens, with winding woodland walks and a splendid spread of old and unusual trees, now in full maturity. There is a river and a private lake. This is an ideal base for exploring County Wicklow, and for visiting Dublin, just 25 Km away. Punchestown, the Curragh and Naas racecourses are within a 30 minute drive. There is a wide choice of equestrian centres and golf courses nearby. Dinner rate Dinner - €50. Book by noon.